A more lightweight and space-saving counterpart to the standard acoustic piano, the best electronic keyboard is a great and often affordable option for beginners or dedicated musicians. Some are even portable, or easy to rest on your lap if you prefer to be more comfortable as you play. An electronic keyboard will obviously not be the same as a real acoustic piano, but some models come pretty close as far as the sound and the feel of the keys. Maybe you’ll like the difference. Keep an eye on the structure of the keys, whether or not they’re weighted, and the material that the keyboard is made out of, if you have a preference. There are lots of options and features available for an electronic keyboard, and it can be hard to filter out the good from the not-so-good. We pooled a selection of the top 10 best brands and the different types of keyboards to make it easier to decide which one is best for you. Here are our picks for the top 10 best electronic keyboards with details about the features, sizing, and extras included. ​This keyboard is designed for users at beginner or intermediate levels. ​This model is lighter than some other keyboards, only 14 pounds. 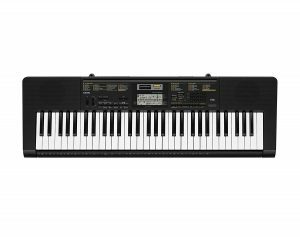 Casio is a very popular brand when it comes to electronic keyboards. This model has a built-in microphone, 400 AHL voices, voice percussion function, and sampling effects. ​This model is great for beginner musicians just starting out, weighing just over 10 pounds with a length of 37 and a half inches. ​Semi-weighted, full-size keys with adjustable touch response and 20-watt built-in speakers make this model nice to play. ​this model is the only one on our list with full-weighted keys to simulate an acoustic piano. There are three different sizes of keyboards available on our list: 61-key, 76-key, and 88-key. The smaller 61-key keyboards are great for beginners, especially kids or musicians that plan on keeping their usage casual. 76-key has more notes, and therefore more music you can play. A full 88-key keyboard matches that of most regular acoustic pianos; it’s better for more serious players and musicians that intend to continue improving and perhaps performing. 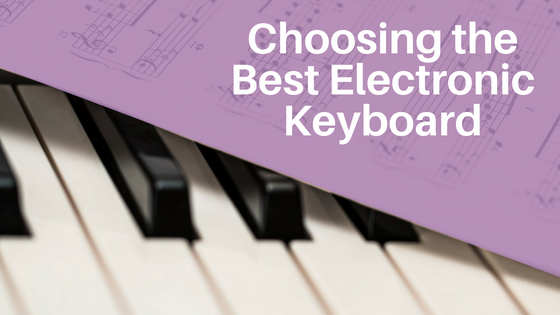 The best electronic keyboard is great for a beginner, or the casual player without a need for the extra keys at either end. While regular acoustic pianos have 88 keys, 61 keys is plenty for beginners to learn on, as the simpler music they’d be playing would not necessitate too many keys. This electronic keyboard comes with standard-size keys, not smaller ones that are sometimes common in other keyboards. It comes with 100 sounds, 100 rhythms, 50 songs, and an LCD screen to make selections. It weighs less than 20 pounds, and can be easily detached from a stand and transported if needed. The keyboard is just over 35 inches long, making it good for smaller spaces. 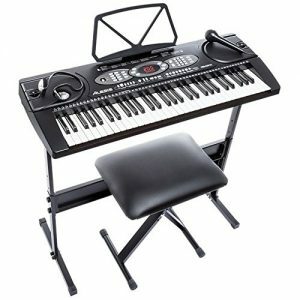 It comes in a kit with an adjustable keyboard stand, a padded stool, headphones, a power supply cord, and learning aids. User friendly: You can practice your skills by playing along with 50 different demo songs. Not for the advanced piano player. One customer review stated that you don't get any of the key-tap-sound-sensitivity like you would on a higher end piano keyboard. No best electronic keyboard list will be complete without a model from Casio. 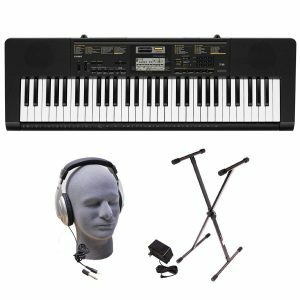 From the big-name brand, this keyboard comes with a built-in microphone, 400 AHL voices, a voice percussion function, a step-up learning system, and intuitive sampling tones of different lengths.Casio Inc. can be powered by an adapter or batteries. 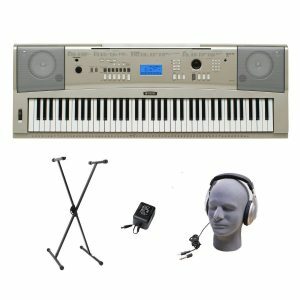 This keyboard comes with a pair of Samson HP30 closed-cup headphones, a keyboard stand, and a power supply cord. The keyboard weighs in at 25 pounds with a keyboard length of 44 inches, and is a popular choice among buyers. Also included upon purchase is a rugged World Tour keyboard stand. This keyboard is designed for users at beginner or intermediate levels. It has standard-size keys, built-in speakers, 61 keyboard percussions, 225 timbres, 225 rhythms, and 24 demo songs. It also comes with a detachable stand for sheet music. The included headphones and microphone make it good for recording and playback, but it does not come with a power supply cord. 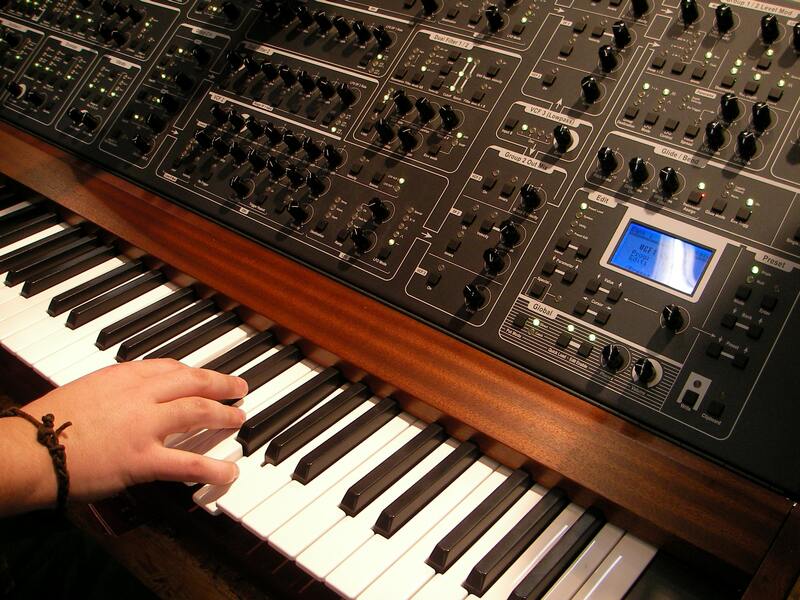 Full-size keys fill the 34" keyboard, and it comes with 60 demos, 300 rhythms, and 300 timbres. This model is lighter than some other keyboards, only 14 pounds, and can be powered by either batteries or a power adapter. It comes with an adjustable, heavy duty steel stand, a music rest, and a power adapter. It also has jacks for headphones and a microphone, a USB port, and an LCD display. Advanced enough for a 5 year old but doesn't have small parts that the baby could choke on. Fun for adults too! Includes headphones, and an adjustable padded bench. Programmed with 200 sounds with layer and split modes, 128 accompaniment rhythms, and 10 featured songs with three instruction modes, it’s a great starting place for a beginner. It can be powered by batteries or a power cord, and it has a USB input port. A power adapter is not included. The keyboard weighs under seven pounds, with a length just under 34 inches. The 128 built-in accompaniment rhythms help you create your own original compositions. 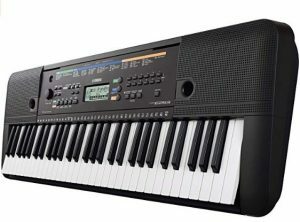 Casio is a very popular brand when it comes to electronic keyboards. This model has a built-in microphone, 400 AHL voices, voice percussion function, and sampling effects. It is 40 inches long, 11 and a half pounds, and comes with a step-up learning program, making it a great keyboard for beginners or casual players. It comes with a power supply and USB output, but no stand. It’s very light, and you can play it on your lap. A customer was satisfied that it comes with a USB outlet, which means you can connect the piano to your ipod or pc, great sampling system, and a song bank. Features a Step Up Lesson system which shows players which keys to push. Kids love the 100+ songs that comes with it. They can just push one button and the song plays. May be a little smaller than the 88 models but has a lot of rhythms and tones. A customer review stated that Casio could have included a headphone jack. Thus, the keyboard needs an adapter to fit the 3.5mm hole. Lighted key models begin with "LK": LK190, LK265, LK280. 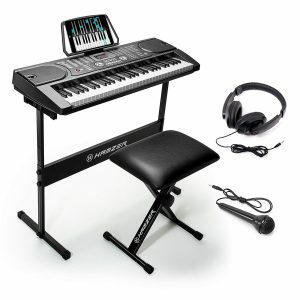 With full-size keys to improve proper technique, this electronic keyboard comes with a duo-mode for practicing with a partner, an Aux Line Input, a portable grand reset button, and 32 note polyphony for sustained notes. It can run on batteries or a power adapter, but the power adapter is not included. This model is great for beginner musicians just starting out, weighing just over 10 pounds with a length of 37 and a half inches. A larger keyboard gives you more versatility, and the ability to play more music with the extra notes available. It’s still not a full acoustic piano size, but noticeably bigger than a 61-key keyboard with almost two more full octaves. Yamaha electronic keyboards are consistently rated and reviewed well, and this one certainly lives up to the reputation. 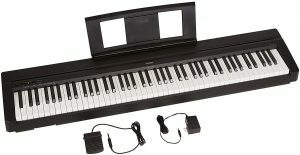 Graded soft touch action piano-style keys give this electronic keyboard excellent playability. It comes with USB and Flash ROM to download new styles and songs, a pitch bend wheel, and a 6-track sequencer. An X-style stand, headphones, and a power adapter also come with it, in addition to 30 built-in songs and 70 more on a CD-ROM. It is just over 33 pounds, and 53 inches long, making this the biggest keyboard in our top ten. There will be no need for batteries either with the included power supply. Comes with a Samson HP30 closed back studio headphones that feature a comfortable, padded headband and earcups with 40 millimeter drivers and a frequency range of 20 to 20,000 Hz. Features a USB & Flash ROM to download new Songs and Styles for playing. ​Full-size keyboards are just like a standard acoustic piano, often with weighted keys to imitate the playability of a real piano. They’re better for more serious players, or those who plan to implement the range of a full keyboard. Consequently, they are also bigger and will require more space than the 61-key models. 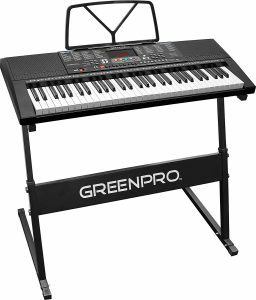 Semi-weighted, full-size keys with adjustable touch response and 20-watt built-in speakers make this model nice to play. They come with 128 max polyphone with Lessons, Layer, Standard, and Split modes, and 5 built-in voices. 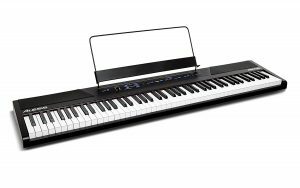 Alesis Recital is lighter and smaller of the two 88-key keyboards we selected for our top ten, weighing nearly 16 pounds, around 50 inches long. Also this can be powered with batteries, or the included power adapter. This is definitely one the best electronic keyboard out there. Boasts a “Lesson Mode” dividing the keyboard into two areas with the same pitch and voice to enable a student and teacher to easily watch each other and play together without having to take turns. Portable. You can switch to using six of your D cell batteries. Another Yamaha, this model is the only one on our list with full-weighted keys to simulate an acoustic piano. It comes with 10 programmed voices (including a real Yamaha grand piano), dual mode to combine voices, and a slim design. It weighs in at 25 pounds, just over 52 inches long, and comes with a power adapter and a sustain pedal. This model is very popular and has consistently good reviews from consumers. Features a Yamaha's GHS (Graded Hammer Standard) weighted action which has heavier touch in the low end and lighter touch in the high end. Giving you honest and accurate data is one of our most important goals to help you find the best electronic keyboard. Thus, we looked into a lot of different sources for our information as we put this article together. To compile our ratings, we checked product data, testimonials, reviews, and overall brand reputation for the best electronic keyboard. The kind of electronic keyboard you’ll want to buy depends on your needs. Are you using it as a casual player/hobbyist? Or will you be using it to record or perform? Ease of use should also come into your decision-making process; you might want a model with fewer bells and whistles. Size is also important, and transportability as well, if you plan on moving around a lot as you play. 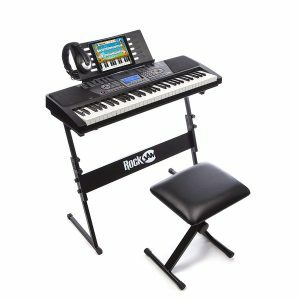 Consider exactly what you’re looking for before you make your final selection, and make sure to read all the features and the extras included with whatever electronic keyboard you decide to buy. 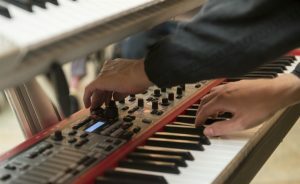 The best electronic keyboard can be a great asset to a musician, whether one’s just starting out or has already learned how to play and is looking to record. Hopefully this guide will give you an idea of what kind of keyboard you’ll like best, what features you want, and what to look for in the one you choose. Finally, for the musically-inclined who's also into improving their vocals and guitar skills, we have the best resources for you.